Customize the look of your living room with the addition of this sectional sofa. Different section pieces will provide plenty of seating in your home, so you can easily stretch out or enjoy more time with the family. Each seat cushion is filled with high quality foam, so you know you will be able to relax in comfort. 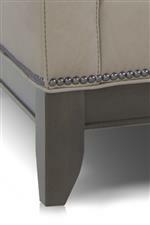 Track arms and tapered legs complement the traditional detailing of the base rails. Choose the right sectional pieces to create your ideal setup. The 238 Transitional Sectional Sofa with Track Arms by Smith Brothers at Pilgrim Furniture City in the Hartford, Bridgeport, Connecticut area. Product availability may vary. Contact us for the most current availability on this product. 238L-25 RAF Loveseat 1 55" 39" 36"
238L-21 RAF Corner Sofa 1 94" 39" 36"